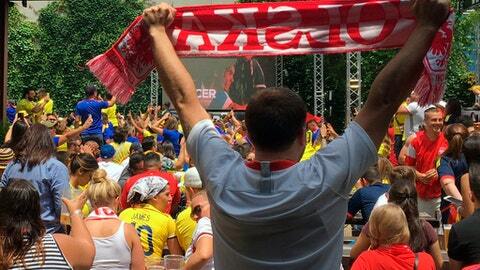 NEW YORK (AP) Standing on top of a wooden picnic table amid a sea of soccer fans in a Queens beer garden, Mark Green yanks off his England jersey and trades it for a bright yellow Colombia team shirt. He congratulates his fellow World Cup devotee and gives him a quick hug. Both Colombia and England won their matches that Sunday, and the swap was a sign of respect. The World Cup for even the most casual soccer fans: Passion and national pride. And even though the United States did not qualify for the tournament in Russia, the scene plays out at bars big and small in neighborhoods across the five New York City boroughs. While the immigration debate occupies politicians and new the ”zero tolerance” policy has thrown thousands of families into disarray, the World Cup shows how much people from other countries help make up the fabric of New York. According to an annual report from the Mayor’s Office of Immigrant Affairs for 2017, New York City is home to 3.1 million immigrants, a new high for the city. They make up nearly 38 percent of the population. Areas with a higher concentration are Queens, Brooklyn and specific parts of the Bronx and Manhattan. While every viewing party was different, each reflecting a bit of the culture of the team’s country, all shared one thing: pride in community. The action in Brighton Beach, a community known as ”Little Odessa,” is by the water. The boardwalk is pretty much empty because most people are down by the surf, enjoying the warm Tuesday afternoon. And there’s a decent crowd in the restaurants for a late lunch. All is calm – until Russia scores a goal against Egypt. Then, Caf� Volna has a quick bout of energy that covers the background beach noises. Once Russia finalizes its 3-1 win, strangers clink their glasses together – most filled with beer – and share smiles and words in Russian. Some don’t take long to pick up their beach chairs and return to the sand about 10 yards away. Others stay put to finish their meals. It is 8 a.m., and the Brooklyn bar with an English accent is already packed. The crowd can be heard several doors down the otherwise quiet street. Not a single seat is available inside. Many people are standing shoulder-to-shoulder, eyes on at least one of the dozen TVs. Normally, the Black Horse Pub doesn’t open until 9 a.m. on Sundays, but England has a morning match against Panama. Coutain, originally from Trinidad and Tobago, supports England. He has family there, many on his mother’s side. He went to the last World Cup in Brazil. Instead of eye black, Coutain has a sticker of England’s flag under each eye, matching his red jersey. He also brought a red vuvuzela – a plastic horn, which some also call a grenade whistle – and blows it every time things go England’s way. It’s loud. Louder than any place should be during breakfast. Yet, it shouldn’t be a surprise. England dominates 6-1. The line to get into Studio Square NYC spans blocks. And there’s a $25 cover charge for the 2 p.m. match between Poland and Colombia. Inside, the place is slammed from wall to wall. Outside, the beer garden is equally crowded. It’s a sea of yellow-clad Colombia fans with splotches of red for Poland supporters – a gigantic tailgate party. Coutain, who switched venues for the later Sunday showdown, said this environment is as close as it gets to being at an actual FIFA viewing party at the World Cup. Remember, he was there in 2014. There are several different noisemakers and instruments, including cowbells, but they’re all silenced when the Colombian national anthem starts. The hookah is also set down. People sing along, with a hand on their heart. Then, waiting for kickoff, they chant, ”S� se puede.” Yes we can. Chaos ensues every time Colombia scores. Drinks get chucked in the air. High-fives are distributed all around. Strangers hug. A couple of people even cry. Colombia shuts out Poland 3-0, and a DJ immediately takes over. Everyone dances. The braves ones try to crowd surf (key word: try). Drinks are thrown, again. Colombia flags wave. More than an hour passes, and the celebration doesn’t seem to have an end. Three generations of a Portuguese family sit together, watching Portugal play Iran. Rosalina and Paula Alves are sisters. Rosalina’s son bounces around in a Portugal jersey – he sported a Colombia one the day before to support his dad’s team. Paula’s baby girl is in a Portugal onesie and wears noise-canceling headphones when things get too loud during the afternoon game – she somehow slept through cheers of Portugal’s only goal without them, though. Their mother was there for the first half but had to return to work. They all know each other very well, but don’t hesitate to welcome a stranger to their table because there’s an open seat. Children run around O Lavrador and help out workers. They get picked up to ring the hanging bell behind the bar whenever Portugal does something that warrants cheering. They pass out MLS tickets to those who win the halftime raffle. Rosalina thinks back to Portugal’s second game – a 1-0 win over Morocco on June 20. It was at 8 a.m., and she teaches kindergarten. One TV shows the Spain-Morocco match. There may only be a few Spaniards in the crowd but their voices are heard as the two teams draw 2-2. Portugal and Iran tie 1-1. Because the U.S. failed to qualify, Reyka Vodka encouraged Americans to support Iceland as its World Cup team and hosted organized viewing parties across the nation. Some of the New York events featured Vikings trivia during halftime – not this afternoon match, though. Reyka, which is made in Iceland, has representatives handing out T-shirts, sweatshirts, sweatbands, flags, koozies and specialty drinks. The Nigeria-Argentina game is also on and the room is charged, not so much for one team. Both games finish 2-1. Argentina and Croatia win. A bouncer blocks the doorway more than a half hour before the Serbia-Brazil game. Full capacity. No wristband, no entrance. That doesn’t deter people, despite someone handing out fliers for another party. They stand outside on the sidewalk, staggering so they could see the TVs inside. Many have the game on their phone to make sure they don’t miss anything. Her two young sons joke around, not paying attention to the game. They ask if Brazil has scored yet, though. That fever is evident inside Miss Favela. A Brazilian band plays before and after the game, then also during halftime and commercial breaks. When everyone starts dancing, it’s no wonder the bouncer stopped letting people in. Either sway with the crowd or be jostled around. When Brazil scores, bartenders spray a sticky drink over everyone. Could be a Caipirinha, the Brazilian cocktail? Not many people leave after Brazil defeats Serbia 2-0. They stay and celebrate. A group of guys in their mid-20s sing in Portuguese with their arms around each other. The World Cup is more than a sporting event.